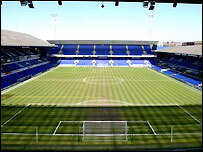 Ipswich Town's pitch has been voted the best in the Championship for the second year running. Town groundsman Alan Ferguson told the club's website: "We're obviously thrilled the pitch has come top again. "It is a testimony to all the hard work that the team has put in throughout the year. "We've had a lot of matches to deal with this year and how often the pitch is used is considered when the marks are handed out." Ferguson added: "It is the first time we have won the award in successive years as well so we have to be delighted with that achievement."